Back in late 2015, I purchased a pair of Pulcinella bottles, and found that they had some kind of odd “gusher” issue with them. I made contact with the folks at Hi-Wire. I didn’t pitch a fit, I wasn’t throwing a tantrum, just brought to their attention that I had a pair of bottles go south on me, and that they might want to keep an eye out for similar issues. I don’t make that third statement lightly. I have had a couple of instances where either I independently or we as a collective on the show have submitted a non-favorable written review of a beer, only to be met with a negative attitude from a brewery. Folks, I’ll say it yet again. A brewery that won’t stand behind their product should be kept at arm’s length. 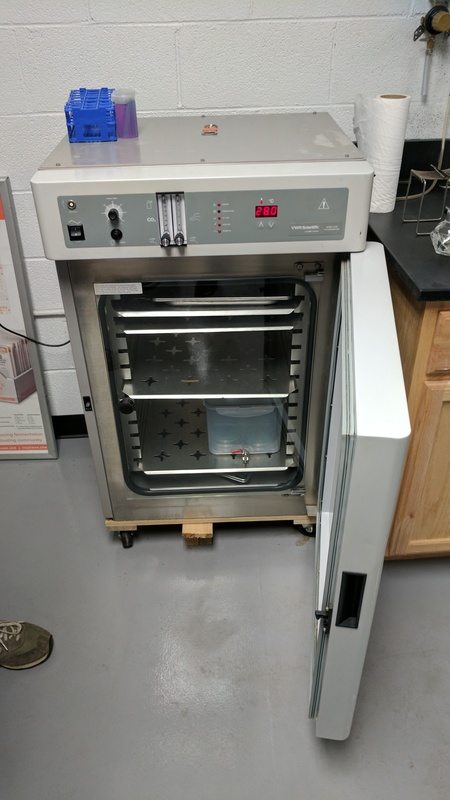 So Hi-Wire responds and said that they had run a test sample from a chilled bottle and saw no issues, but were going to also test a warm bottle and see what they came up with. Sure enough, there was an issue, and they immediately communicated to their customers that some room-temp stored bottles were having re-fermentation issues (not all, but some), and then outlined their new procedures to prevent this from happening again.. This, ladies and gentlemen, is a great sign. In an era where new breweries pop up every day, you shouldn’t waste your time with someone that doesn’t stand behind their product. 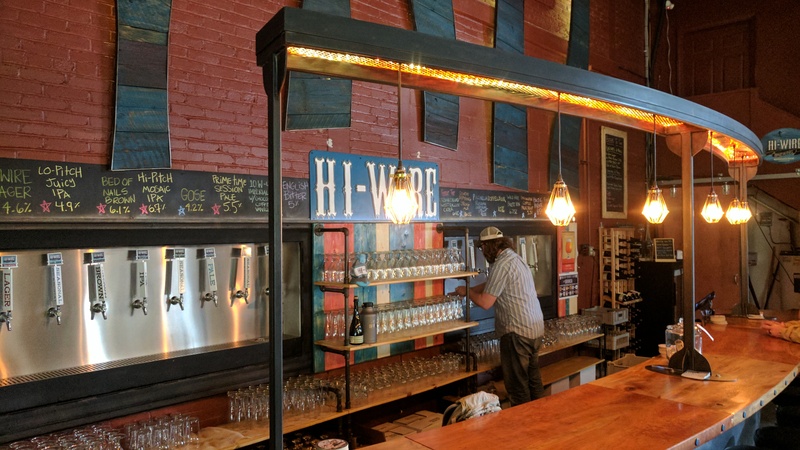 Now with that short narrative out of the way, I’m going to try to put aside my bias for a bit and talk about the production facility and taprooms for Hi-Wire. 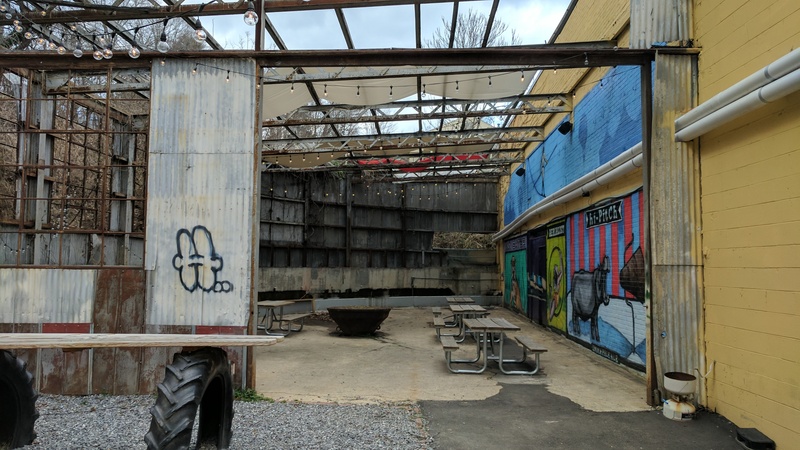 They have a site known as “South Slope” that is right next door to Asheville Brewing, closer to the center of town, and then also one that’s next door to the Appalachian Vintner bottle shop, which also serves as their production facility, which is known as the “Biltmore Village” location. The Biltmore Village facility is quite impressive, featuring a large space with lots of equipment. The bar is very warm with comfortable lighting and seating. They have a full selection of their current beers on tap, and it’s a really neat place to go sit and chill. 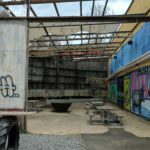 One new addition to this facility is an area out back that is secluded from the rest of the brewery and has a wholly different feel from the taproom or the front of the brewery. 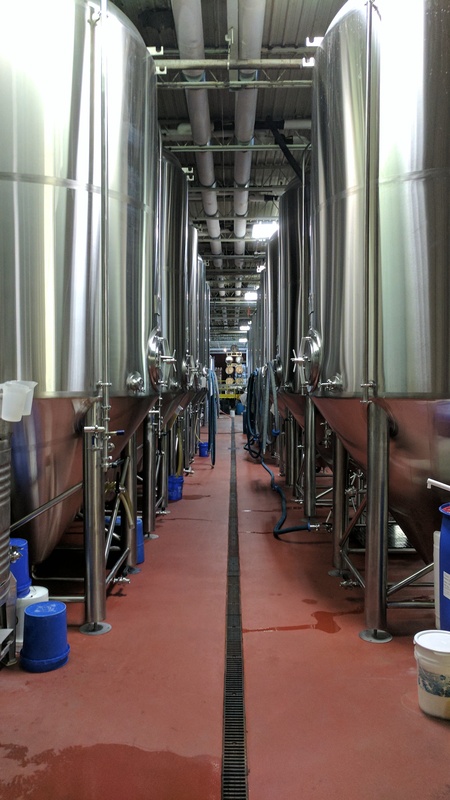 I’m fortunate enough to get some time with Chris Frosaker, (who initially went into his post-graduate life as a pharmacist) and as we wander around and ask questions, it really begins to resonate for me how methodical and purposeful the layout of the facility is for the production of beer. If there’s one word I keep going back to, it’s _purpose_. 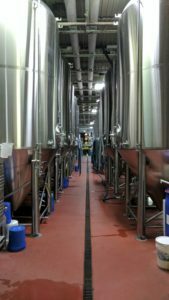 Sure, if you’ve been on a brewery tour, you’ve not doubt noticed that it makes sense to keep the brewing kettles close to the grain mill, but there’s something more here…it all weaves back and forth, each section set up next to the last, making a logical and efficient path through the brewing process…. Hi-Wire is in a building that’s more than they need. They did this on purpose. 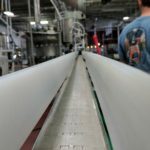 They have installed just enough equipment to allow them to run at 10% of what the space will accommodate, giving them plenty of future growth, without the worry of producing enough to pay for equipment they don’t need to use. This also helps them keep from the worry of having to produce a high volume of beer that would just sit on shelves due to over-saturation of their product, thus impacting their brand. They did this on purpose. 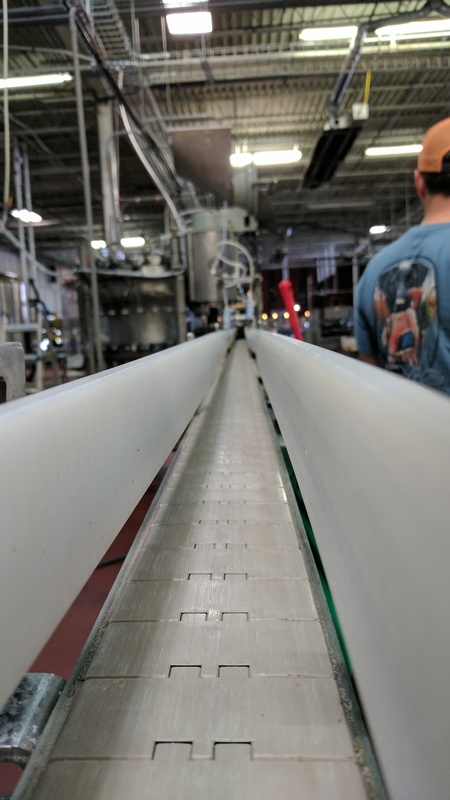 Hi-Wire uses a centrifuge system to filter their beer, instead of an actual filter. This helps prevent the flavors from being stripped out of their beer. Purpose. They now have a hi-tech lab that can take samples of their beer to watch for any possible bugs in the beer. Their dedication to quality isn’t just words, however. They pull a six-pack from just about each bottling/canning run, and store it in their lab. 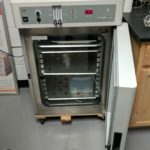 That way, if there is a concern of contamination, they can put a sample in a petri dish, let it sit in the incubator, and see if there is an issue, at which point they can jump into action. They run samples on new barrels so that they can determine which are safe for use in their regular beers, which are better suited for their sour program, and which don’t make the cut at all. Chris was generous with his time and you can hear the passion in his voice. They want to do well, but only where it makes sense. Only where there’s purpose. Hi-Wire may not have the marketing glitz and glamour that some other breweries may have…they may not get the same breathless anticipatory frothing of the mouth whenever they put out a new beer, but I’ll tell you one thing: Do _not_ sleep on this brewery; seek them out, find their beer, and drink it…on purpose.